I know lots of us are thinking about gifts at this time of year. You can’t go wrong with books, that goes without saying, and I will have a long list of book suggestions for you on December 5. But if you are buying for new parents, here’s something intriguing to consider. 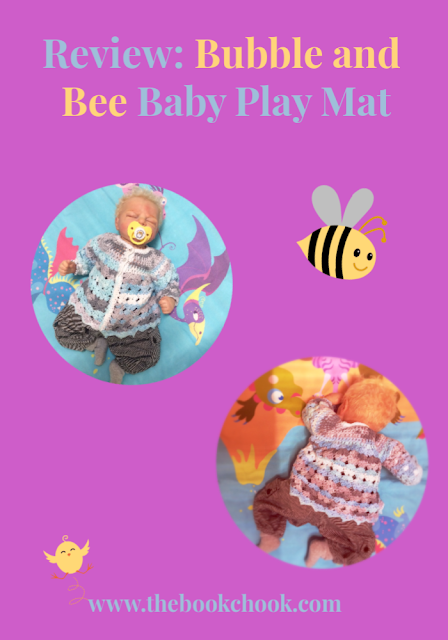 The Bubble and Bee Baby Play Mats are such a sensible idea, and the brainchild of an Adelaide mum. Basically, the mat is somewhere soft for Baby to lie on while the edges stop him from rolling onto the general floor area or under furniture. You can also use just the mat with no edges if your baby doesn’t yet need them. * It’s compact when you pack it away, and there is a nicely made, sturdy bag with a handle so it can go on picnics and outings. * It’s big - 140cm x 140cm - enough for more than one child. * The designs are playful and attractive. * It’s easy to put together if you want the edges. The foam sides look a bit like pool noodles and slot two to a side. There’s an opening in the middle of each of four closed sleeves, and you insert one foam piece on the left and one on the right. Then you simply velcro that sleeve onto the base. It took me about 3 minutes. * It looks robust. Full disclosure: I didn't test it with a real baby. My little model, Arthur, is actually an incredibly life-like baby doll - basically Little Arthur just lay there, looking cute. But I carefully checked out the mat at the seams and joins, and believe they will stand up to normal wear and tear. Check out the Bubble and Bee website’s shop (which does take a little while to load) for prices and to see your options - mat with edges, or mat with no edges. And if you’re looking for something else to add to this gift? Hey, what about a book or two? Just click Reviews in the sidebar, or check out my review page on Pinterest.